Thanks to the arrival of Citi Bike, there's been an appreciable increase in cops ticketing cyclists. What cops are still figuring out, apparently, is how to get the cyclists stop without knocking them off their bicycles into traffic! 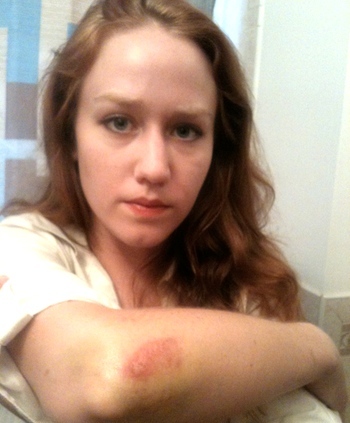 25-year-old Emily Dalton alleges an officer did just that as she was pedaling her bike to work the morning of July 11. Dalton was riding along 8th Avenue in Chelsea when she glided through a light—she's uncertain whether it was red or green. But according to at least one nearby officer, it was red—and she'd just ridden through it. His method of detaining her? The officer grabbed her handlebar as she passed, jolting Dalton from her bike and sending her sailing into the road. Dalton, stunned and bloodied—though not seriously harmed—said she spent several minutes shouting at the officer, unable to understand why someone whose job it is to keep her safe was the reason she'd nearly been smashed by a car in the middle of 8th Avenue. "I was terrified," she said. "I was in the middle of a New York street!" The officer, she said, was unfazed neither by Dalton's scraped elbows and knees, nor the fact that the severity of the crash managed to bend her bike tire and cause the chain to fall from the drive train. His only concern, Dalton said, was getting her ID, which at the time she didn't think she had. Shaken, Dalton retreated to a nearby bench. Another officer on the scene called an ambulance, despite the fact that Dalton said repeatedly that she didn't need one. "I kept saying 'I just want to go, I'm fine, let me go, let me go,'" she said. "I was just so frustrated, and I was scared, and all I wanted to do was get out of there." The officer who made the grab continued to ask Dalton for her ID, which she finally found in her bag after emptying its contents on the ground. She ended up with two tickets—one for running a red light, and another for "failure to comply," a charge which Dalton said was never explained to her. The ambulance eventually arrived and iced her wounds—luckily, Dalton said, she was wearing a helmet, so her only injuries were scrapes. After more than an hour, Dalton was allowed to go to work. She never got an apology from the officer. "He told me to follow the road signs, but he never once said he was sorry in any way, shape or form," she said. "He never asked if I was OK."
Daniel Flanzig, Dalton's lawyer, said the problem isn't just a rogue bad—or possibly just impolite—police officer. The problem is the fact that there's no established system for pulling over a cyclist, in spite of the increasing need to do so. "There's no post-academy training on how to deal with this new culture," he said. "There are bad cyclists, there are bad cops, and everyone has to learn how to get along." He said that despite the existence of a voluminous code of conduct for a vehicular traffic stops, there appears to be no established protocol for stopping a cyclist. "If she ran a red light and he pulled her out of the car, it would be crazy," he said. "Why, if she was on a bike, would it be any different?"